In December 2013, new gutter work was taken up on the road adjoining Vaccine depot ground which connects to Mandoli road in ward no.17. Since the early morning, this road is utilized by the morning walkers in which there is a size bale amount of senior citizens. 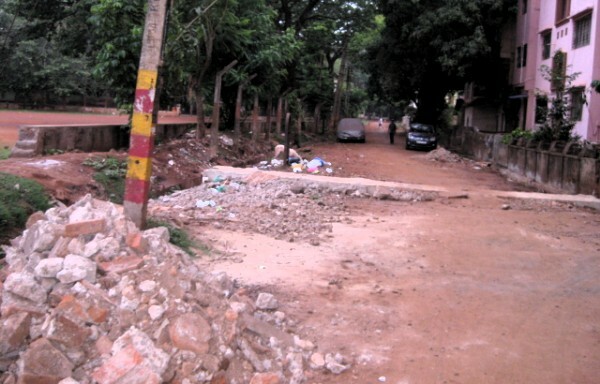 The scene repeats in the evenings, but due to the shabby work done by the contractor which is still incomplete in reality but should be completed in the books of the corporation is causing huge adversity to the residents of the area. The drain work which was commenced in the month of December 2013 and still going on at a slow pace. Infact last so many months not even a brick has been moved. Residents are asking Who is responsible, accountable for this type of work ? Corporation Staff, Contractor, Corporator ?